Being an eminent Noida based institute, we offer six months Industrial Training (real-time) to B.Tech, M.Tech, B.Sc., M.Sc., BCA and MCA students. As the institute is a subsidiary of renowned software company ‘PureSoftware (P) Ltd.’, you can rely on the quality trainings provided. Our 6 Months Industrial Training will aid you in comprehending the practical implications of different concepts and technologies. This training offers practical exposure and can also fulfil your course curriculum requirement. Students who are in 3rd and 4th year of B.E. / B.TECH or 2nd and 3rd year of BCA/ MCA or 2nd year of BSc IT/ MSc IT. Students who have passed out / pursuing M.Tech / B.Tech / MCA/BCA/MSc IT/ BSc IT or wish to do. At ‘PureTrainings’ regular Mock Interview Sessions are conducted for the candidates. With right self-assessments, it would become easier for you to choose the careers/internships that best fit your interests and personality preferences. Our experts will guide you in the exploration of resources and techniques for finding and evaluating the potential positions. You will learn the methods of resume and cover letter writing, interview techniques and preparation. After completion of the 6 months Industrial Training, the candidates become proficient to solve problems in a real-time environment. The training will boost their confidence and open a window to the professional world. Our experts guide the candidates to find a connection between their chosen field and required industry standards. 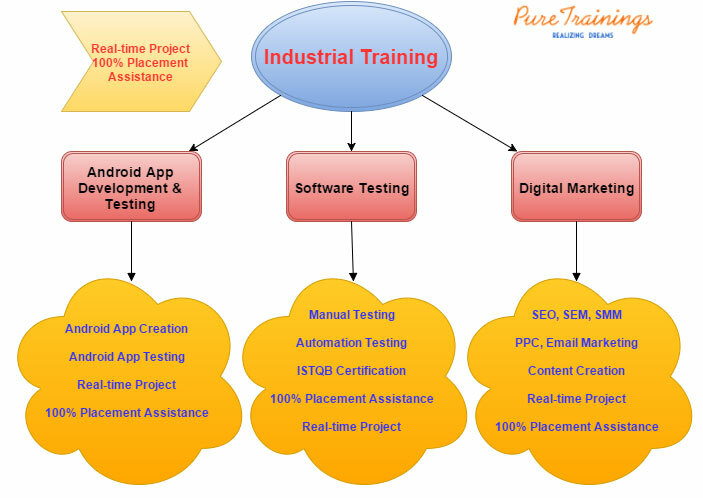 The 6 Months Industrial Training provided at ‘PureTrainings’ is a paid training. This course has only limited seats available. All the interested candidates are required to fill our enquiry form. For any further queries, candidates may visit our office on any working day between 10:00AM to 5:30PM.